Have you tried neuroxing papers? It. 's a very easy and cheap process. You hold the page in front of your eyes and you let it go through there into the brain. It’s much better than xeroxing. Quoted in L. Wolpert and A. Richards (eds. ), A Passion for Science (1988), 104. I will ask you to mark again that rather typical feature of the development of our subject; how so much progress depends on the interplay of techniques, discoveries and new ideas, probably in that order of decreasing importance. This is the original quote, which gave rise to the commonly seen misstated shortened quote as: “Progress in science depends on new techniques, new discoveries and new ideas, probably in that order”—with the qualifying words “interplay” and “decreasing importance” omitted. From Brenner’s own handwritten notes of a Speech (20 Mar 1980), 'Biology in the 1980s', at the Friedrich Miescher Institute in Basel, Switzerland. Reproduced in his article 'Life sentences: Detective Rummage investigates', The Scientist (19 Aug 2002), 16, No. 16, 15. He reflects on the original wording of the quote, from his notes that he “came across”, while rummaging through “the piles of papers that I have accumulated,” (hence “Detective Rummage” in the title). 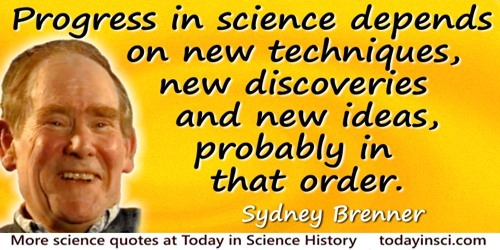 See more on the commonly seen misstated shortened quote also on the Sydney Brenner Quotes web page of this site, beginning, “Progress in science…”. It is now widely realized that nearly all the “classical” problems of molecular biology have either been solved or will be solved in the next decade. The entry of large numbers of American and other biochemists into the field will ensure that all the chemical details of replication and transcription will be elucidated. Because of this, I have long felt that the future of molecular biology lies in the extension of research to other fields of biology, notably development and the nervous system. Letter to Max Perua, 5 June 1963. Quoted in William B. Wood (ed. ), The Nematode Caenorhabditis Elegans (1988), x-xi. Progress in science depends on new techniques, new discoveries and new ideas, probably in that order. 13 Jan - short biography, births, deaths and events on date of Brenner's birth. My Life in Science, by Dr. Sydney Brenner. - book suggestion.